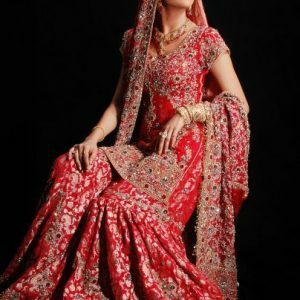 Tags: Bridal, Chatta Patti, Deep Red, Lehenga, Reception & First Day, Rust. Deep red pure chiffon shirt, pure banarsi chiffon dupatta and pure banarsi chiffon Lehengha. Lehengha made with different fabrics and whole dress adorned with silver embroidery.